A sudden, fierce attack of armyworms is currently underway on Panhandle forages. Livestock and hay producers should be on the lookout for this pest. Recently, cases of infested pastures have been identified in multiple counties across Northwest Florida. Insect pests of pastures are usually found in the form of fire ants, mole crickets, spittlebugs and caterpillar type creatures commonly referred to as armyworms. For the Florida Panhandle, armyworms can be active from April through December, but are most commonly found in high numbers during the summer months. 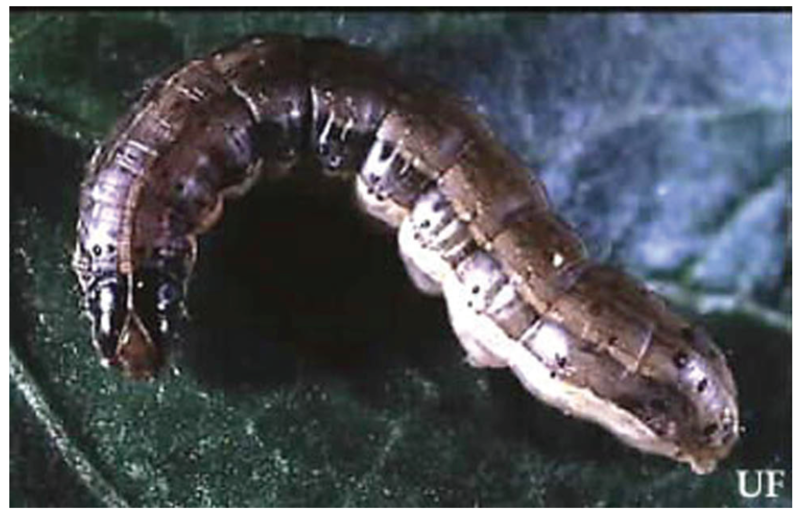 Figure 1: Fall Armyworm Larva. Credit: J.L. Capinera, UF/IFAS. The armyworm is the immature stage of the adult, grayish-brown moth. The life cycle begins with the female moth laying its eggs on lower leaves, close to the ground. Mature larvae will reach 1 to 1 ½ inches in length. As soon as the larvae hatch, they begin to feast. Armyworms get their name because they often move in large numbers and in waves, as they search for food. The life cycle from egg to moth is completed in around 30 days. The number of generations occurring in an area varies. There are four main types of armyworms that are found in this region, although others can exist. The southern and the yellow stripped armyworm rarely eat grasses. Their diet mostly consists of vegetable or field crops. Beet armyworms also priamrily feed on vegetables and field crops, however they are sometimes found in alfalfa fields. Fall armyworms consume forage grasses and cause extensive damage through widespread stripping of leaf blades. The fall armyworm is a native to tropical regions, stretching from the U.S. to Argentina. These moths are strong fliers, that can cover long distances. Keeping a close eye on your pastures is the key to early detection. Larvae will feed primarily during the cooler hours of the day, or longer on cloudy days. During the daylight hours it is best to look under leaves or in shaded areas. Small larvae begin feeding on the bottom blades of grass. Larger than normal populations of birds feeding in the pasture is also a key sign for producers to recognize, however at this point the infestation is already under way with larger worms. In addition, Armyworm infestations in pastures usually start in small patch areas. A rancher should make efforts to frequent fields for inspection this time of year. Scouting is very important. If caught early, spot treatment is the management measure recommended to prevent a widespread infestation. Spot-treatment will reduce the amount of insecticide needed, and reduce injury to pasture grasses. Granular, wettable powder (WP), and emulsifiable concentrate (EC) formulation insecticides may be used to control pasture armyworms. The granular formulations come “ready to apply,” while WP and EC formulations are diluted in enough water for sufficient coverage, with usually a minimum of 3 gallons per acre by air and 10 gallons per acre by ground. Many of these insecticides are restricted use and will require a pesticide license to apply. Small armyworms are not as difficult to control, larger worms may require a restricted use insecticide. Treatment must be made as early as possible to prevent extensive damage. Contact your local county extension office for more information.